Universal Design Studio set out to showcase the best of British craftsmanship and design in one of Paris’ most prestigious locations. British architecture practice Universal Design Studio has designed the interior of Mulberry's newly opened store on the prestigious Rue St Honore in Paris, with bespoke features -- from the brass entrance door handle inspired by the iconic Mulberry's postman's lock to each timber and marble display fixture in the shop. The brief was to create a destination concept store for the luxury goods retailer in the major fashion capital. The design was to emphasise the personality and heritage of the brand and represent the best of British craftsmanship. Mulberry, established in Somerset in 1971, is named after the tree that Mulberry founder, Roger Saul, walked past every day to school. Now Mulberry is a leading luxury leather goods brand. 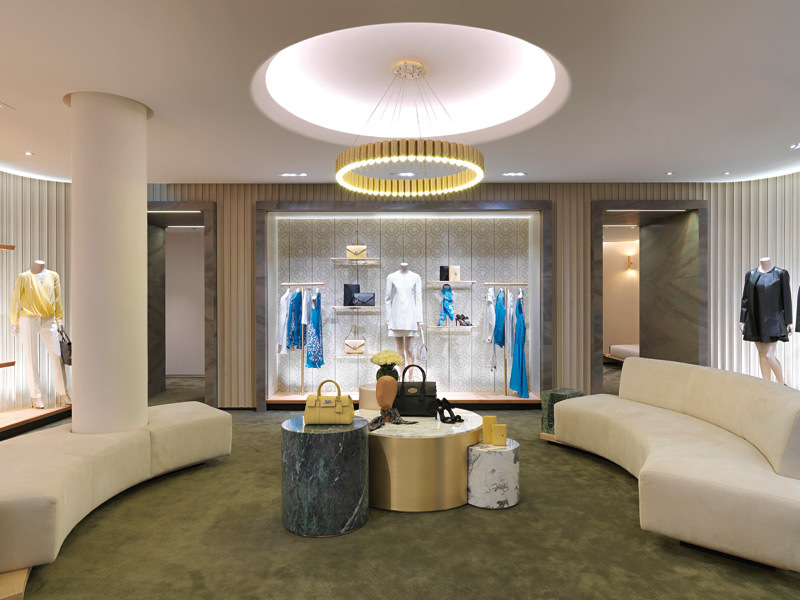 Mulberry had been seeking a flagship destination on Rue St Honore, a prime site that is home to some of the world's most prestigious luxury brands. 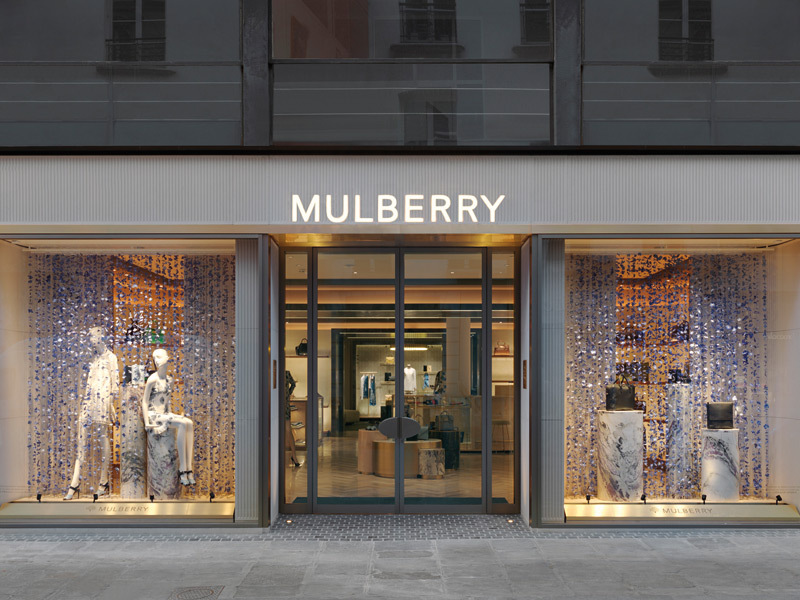 This flagship joins Universal Design Studio's portfolio of Mulberry stores, including in London, New York and Singapore. 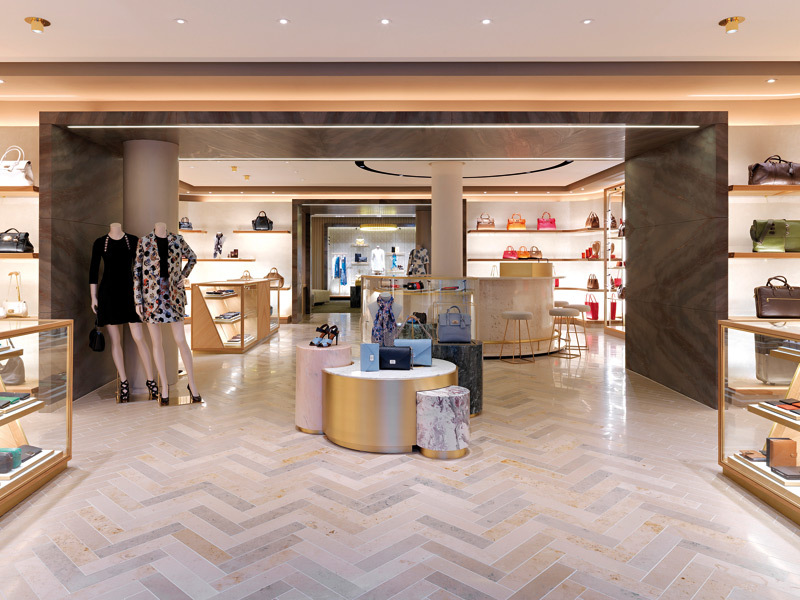 The design of the interior emphasises the personality of Mulberry with a sophisticated display of original British craftsmanship and architectural skill to present distinct sections, each specialising in different luxury products, with a multi-tonal herringbone stone floor linking the different areas. A calm atmosphere has been created through the use of pale oaks, marble, leathers and limestone floors. A dynamic lighting system has been set in place that changes the ambient mood over the course of the day and evening through the use of up-lighters that respond to the light levels outside. Developed by Spiers & Major, the lighting concept emulated the diurnal shifts of the British countryside into the store design. The store's lighting changes throughout the day, from a cooler morning light to a warmer evening environment. The bespoke timber shelves have integrated LED lighting that showcases the crafted products and enhances their natural textures and tones. Being in the heart of Paris there were planning challenges over the design of the bespoke fluted-stone facade, which took more than one submission before approval was granted. The building structure also has a number of columns, which were not ideally located, but this led to them being used to create three boutiques within the store, which the designers framed with earthy marble thresholds. For the interior London-based textile artist Genevieve Bennett created a bespoke leatherwork tile design that is used for wall panels, and award-winning English designer Lee Broom was commissioned to design a feature brass chandelier. 'Mulberry is always keen to collaborate with other designers and craftsmen, and collaborating with a British leather artist such as Genevieve felt very appropriate to the brand. 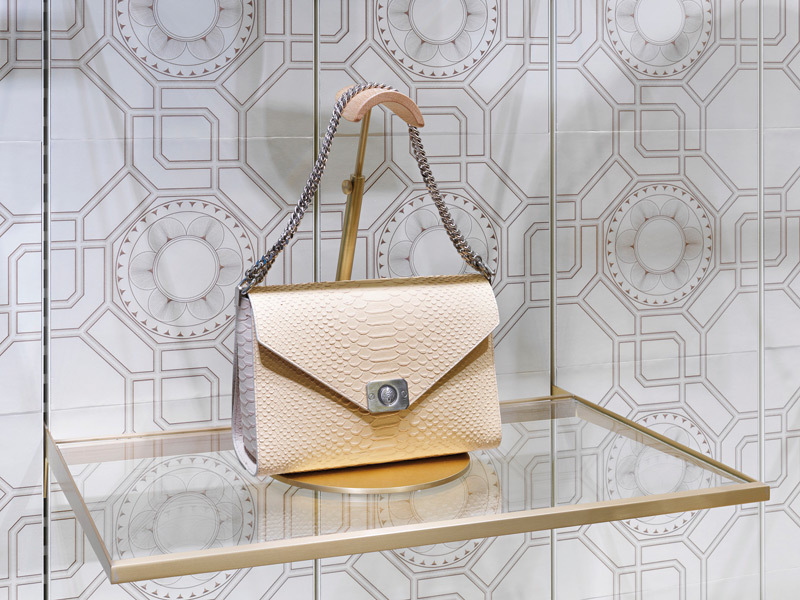 Genevieve worked with Mulberry to design a bespoke engraved leather wall tile for its stores, which forms a backdrop to their branding display space,' says Hannah Carter-Owers, co-director of Universal Design Studio. 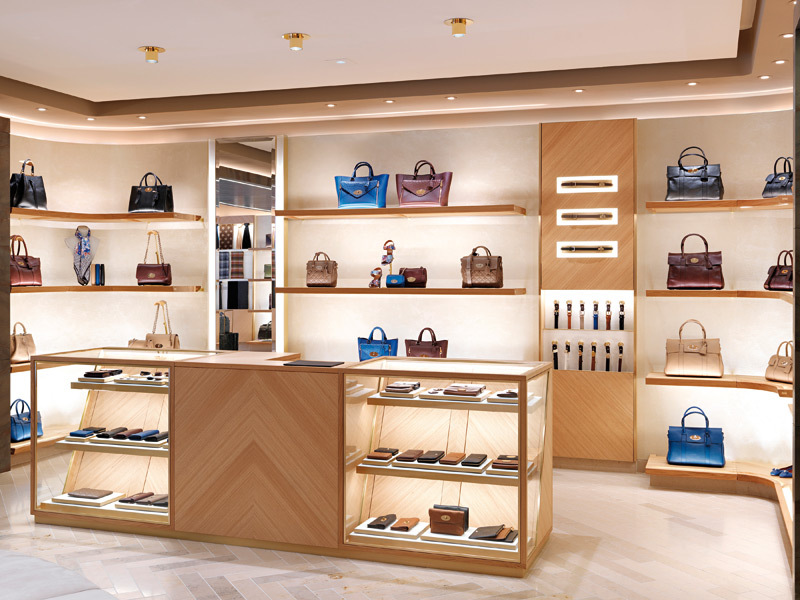 Personalisation has been identified as currently key to luxury and Universal Design Studio created an area in the store to offer a bespoke monogramming service for leather goods. 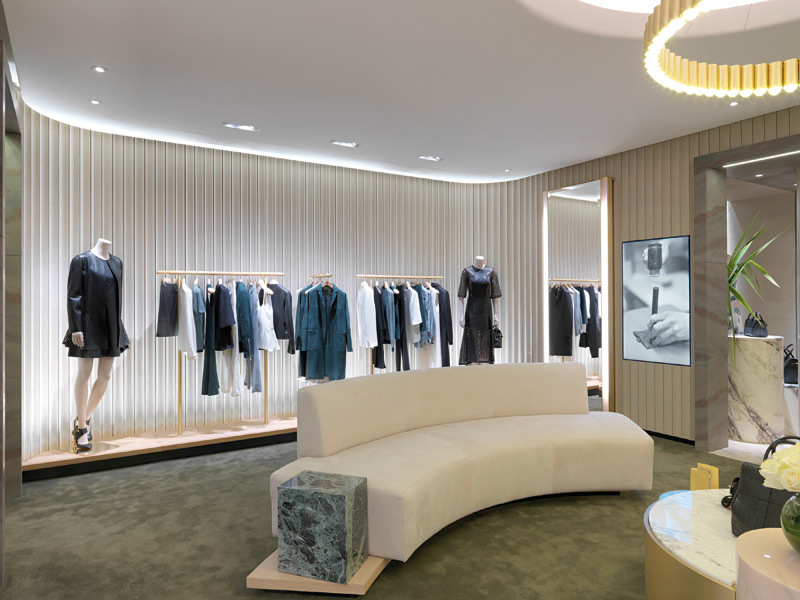 A circular stone and glass personalisation bar at the centre of the store will be a focus for customers wanting to see examples of personalisation, as well as French and British product icons that are exclusive to the store. At the rear the Ready-to-Wear Room offers customers a more luxurious 'dressing room' environment in which to browse apparel and shoes. A sage silk-effect green carpet, soft fluted walls, luxuriously upholstered furniture and chandeliers create an atmospheric contrast to the open, external feel of the accessories areas. 'We're particularly pleased with how effectively the materials and quality of craftsmanship reflect the roots and heritage of the Mulberry brand,' says Carter-Owers.